Suzuka: Lewis Hamilton romped to victory at the Japanese Grand Prix on Sunday to close in on a fourth world title after Sebastian Vettel retired with engine failure on lap four. The Briton dominated from pole, steering his Mercedes to a crushing eighth win of the year, stretching his Formula One championship lead over Vettel to 59 points with just 100 left to play for. “Honestly, I could only have dreamed of having this kind of gap,” said Hamilton after holding off a late charge from Max Verstappen in Suzuka. The Red Bulls of Verstappen — who stunned Hamilton to win in Malaysia last week — and Daniel Ricciardo secured a double podium for the second successive race. Valtteri Bottas finished fourth in the second Mercedes with Kimi Raikkonen’s Ferrari taking fifth and Esteban Ocon sixth for Force India. 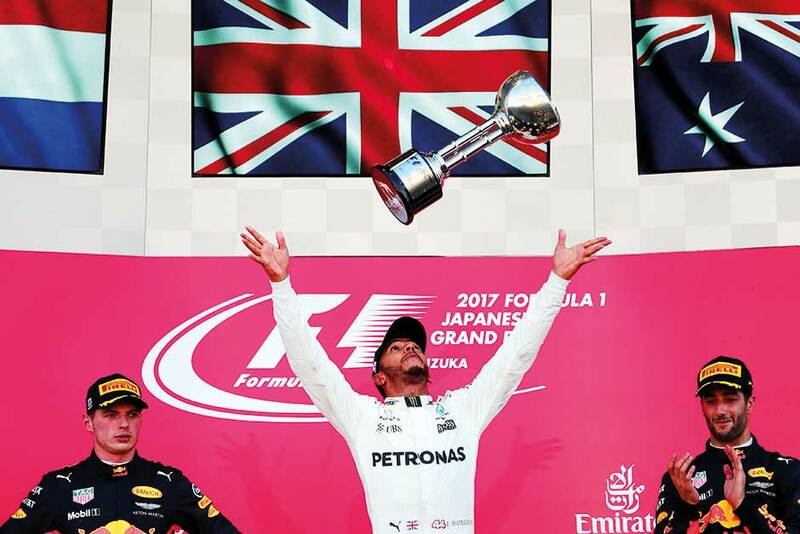 Hamilton celebrated a fourth victory in Japan and a 61st career win with a ‘Mobot’ pose, a tribute to his friend Mo Farah, the Olympic champion athlete, who was watching trackside. “Max drove an outstanding race and it got very close at the end,” said Hamilton. “His car was looking so big in my mirrors. It wasn’t a walk in the park today. There’s still a long way to go,” added the Briton. Vettel’s title hopes, meanwhile, suffered a potentially fatal blow with four races left following a nightmare start from the front row. Ferrari mechanics worked frantically on the grid to fix a spark plug issue before lights out and Vettel was quickly complaining of a lack of power. The German, who finished fourth in Malaysia and crashed from pole in Singapore before that, plummeted to sixth on the first lap before being told to retire the car as Hamilton roared away into the distance. “It’s just a pity in the two races with the reliability issues,” said Vettel, who led the championship just six weeks ago. Ferrari, who have struggled with reliability issues since the summer break, later blamed the faulty spark plug for the car’s loss of speed. The warmer conditions were supposed to favour the Ferraris but Hamilton ruthlessly converted his record-breaking pole position by rapidly taking a stranglehold on the 53-lap race. Verstappen raised pulses over the final two laps but ultimately his charge was too little too late to prevent a fourth successive Suzuka win for Mercedes. Also in the points, Sergio Perez finished seventh for Force India ahead of the two Haas cars of Kevin Magnussen and Romain Grosjean with Felipe Massa holding off Fernando Alonso’s McLaren to take 10th for Williams.